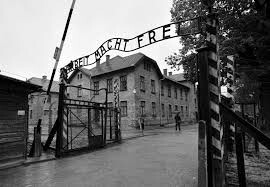 Auschwitz 1 was for polish political prisoners in 1940. This camp was built on the outskirts of the Polish industrial town of Oswiecim. This camp was refereed to as one of the main camps. Auschwitz 1 was used as an concentration and labor camp. In 1943 the number of inmates had grown to 20,000 people and as a result of this in 194 they had 28 two-story barracks. In 1940 when the camp was first established the number of people held there was 6769 then by 1944 that number grew to 29513. This picture shows the entrance to Auschwitz 1. The words written on the entrance said "work sets you free". 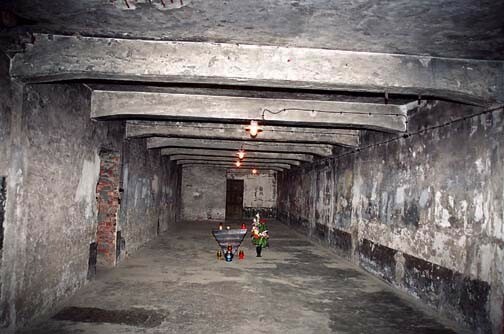 living conditions in Auschwitz 1. Living conditions in Auschwitz 1 were just like all the other concentration camps, dirty and horrible, all the inmates had to sleep on brick beds and had no pillow or blanket. Both in the orning and in the afternoon prisoners would be ordered to get into lines of 10 to be counted for role call. if any prisoners had died at night or while working others had to carry their bodies to role call to be counted. Prisoners would be woken up at 4 A.M. by their Kapo (inmate in charge of a work team), at breakfast you would receive 10 oz of bread and some "coffee". Next prisoners would go to roll call and line up in rows of ten an then counted. After roll call you would go off to work at your Kommando where you would get tools if your lucky and work on digging trenches or boring tunnels or even carrying rocks around. After working all day the prisoners would walk back to the camps carrying the prisoners that had died that day. Next they had a evening roll call where they would do the same thing as in the morning and line up in rows of ten to be counted, and then for dinner you would receive soup and you could eat any bread that you had left over from the morning meal. There were many main figures in Auschwitz 1, one of which was the author of night Elie Wiesel. Another was Estella Agsteribbe, he was a gold medal winning gymnastic that was in the 1928 summer Olympics. Auschwitz II or Birkenau was built in October 1941 and held more then 100,000 and was a site of mass killing. Auschwitz 2 was both a concentration/labor camp and an extermination camp. 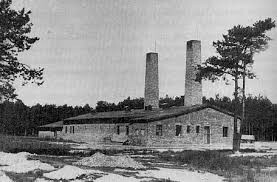 This camp had gas chambers and crematories that were capable of disposing around 2000 a day. by the time 1944 came rolling around it was able to kill up to 6000 per day. Historians and analysts estimate between 2.1 and 4 million people were exterminated at Auschwitz Birkenau. This is the sight you see right as you are trained into Birkenau. Once many prisoners say this entrance they thought that this was the end because they had heard rumors about it from other camps. 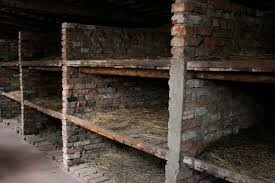 This is what the crematoriums at Birkenau looked like. Piles of people that had died from working all day would be pilled up outside waiting to be burnt to ashes. This is a photo of the gas chambers at Birkenau. hundreds of inmates would be pilled into these chambers at a time. Nazis would release gas through little air vents in the walls to kill the inmates. 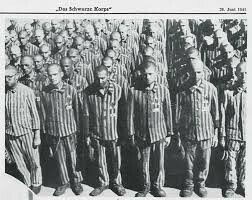 Just like Auschwitz 1 all prisoners were awakened at 4 A.M. by their Kapo officer. Once awake the inmates would go to get breakfast. At breakfast the inmates would receive around 10 oz of bread and coffee. After breakfast it was time to work. A WVHA decree of March 31, 1942 established a minimum working day of eleven hours in all concentration camps. Labor was used as one of the means to destroy prisoners. Work started out as working on the camp by leveling the ground, putting up block, laying roads, and digging ditches. Later the third Reich increased the labor load which increased the death rate by n extreme amount due to starvation and dehydration. There were many main figures in Birkenau One was the author of night, Elie Wiesel. Another famous figure that was at Birkenau was Kaj Munk, a famous Danish playwriter and a lutheran pastor.